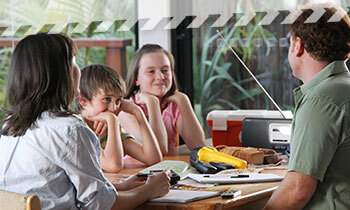 Preparation isn't just about cleaning up around the house and having a bush fire survival plan. It's also about making sure you consider your physical, mental and emotional preparedness. A bush fire can be a terrifying situation. Strong gusty winds, intense heat and flames will make you tired quickly. Thick heavy smoke will sting your eyes and choke your lungs. It will be difficult to see and breathe. The roaring sound of the fire approaching could be frightening. Embers will rain down, causing spots fires all around you. Power and water may be cut off. You may be isolated, and it will be dark, noisy and extremely demanding both mentally and physically. If you have any doubts about your ability to cope, you should plan to leave early, well before a fire reaches your area and well before you are under threat. People who are at higher risk, such as children, elderly, disabled or with medical problems, should always leave early. Leaving early is always your safest option. To help your family prepare for a bush fire, you need to make a bush fire survival plan. This will help you make important decisions like when to leave, what to take, and what to do with animals. You can assess your risk using the bush fire household assessment tool.